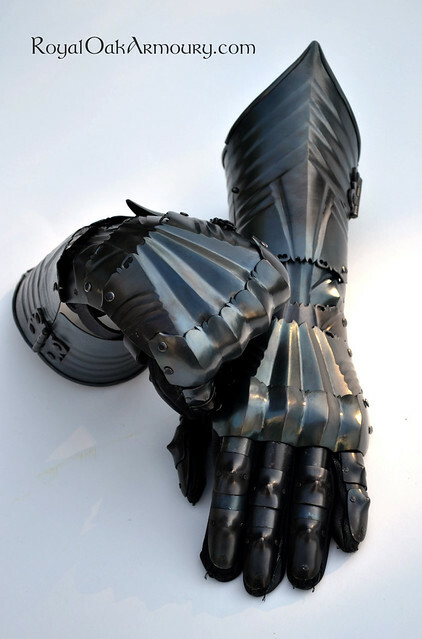 The latest project to come off my bench is a pair of gauntlets in the German "gothic" style, c.1480-90. They are constructed in 1050 steel, hardened and blackened. Articulation with slotted rivets gives a wide range of wrist motion despite the limited number of lames there. Many of you may be familiar will Wade Allen's excellent personal collection of original arms and armour, and how he has made his research available to the public on his website, allenantiques.com. 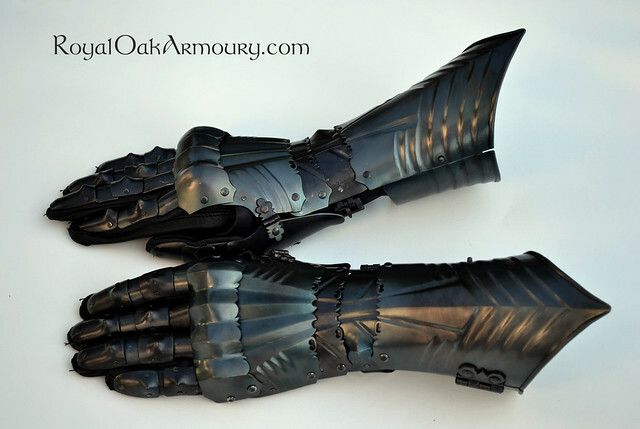 This latest pair of gauntlets is based on a piece in Wade's collection, and I am indebted to him for the effort he has put into sharing his careful and accurate observations, photos and articulation videos on his site. 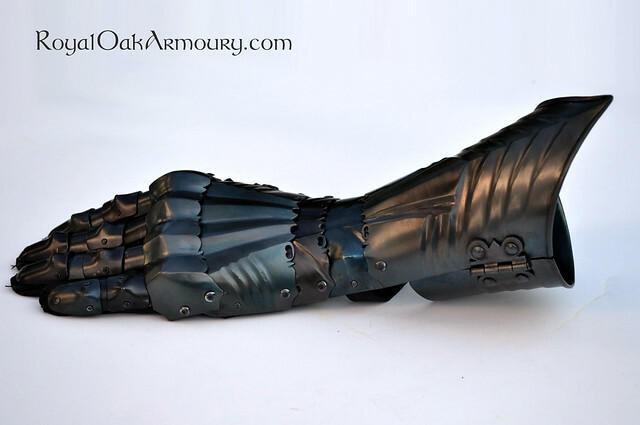 I have more images, including some construction shots, of these gauntlets posted on my Facebook page. Truly a work of art and the utmost skill. Congratulations on your creation, and your talent and discipline! "This skill," asked Kazan, "is it the horse's or the man's?" "The man's, lord," they said. "No! If the horse did not play its part the man could not vaunt himself; the skill belongs to the horse." A technical tour de force. Impressive. Wow Jeff, you are a bona fide badass armorer! Those gauntlets look really sinister like they belong on medieval Vader, or perhaps even as part of the design of a knightly Robo-Cop. I really love how you blued it, I've always loved blued armor. Really nice! I would love to see them in motion. To verify these are real and not photoshopd things please p.m for my shipping address. I considered taking a video of the articulation, and now I wish I had. I made them for a practitioner of WMA, so I put a good deal of effort into maximizing their range of motion. That being said, the originals are both humbling and inspiring in their excellence.